This card can be Normal Summoned or Set without Tribute. In that case, the original ATK/DEF of this card become halved. Welcome to my evil little Rise of Destiny week. Basically, I want to cover the obvious here -- the cards you either know are good already and may have missed a combo on, or to educate the players that have been out of the loop so they can say "Oh man, this card's good, I need to get it!" This is going to be one of those overlooked little cards...until it slaps you in the face for over 10,000 damage in 1 turn. Fusilier is one of those rare cards whose type, sub-type, and effect are all positives. I'm not going to waste your time saying "blah blah blah, you could actually Tribute for him" or anything like that. The reason I picked this card is because of a few cards that combo with it so well, it BEGS for a deck to be built around it. Combo card #1: Megamorph. Megamorph is based off of the ORIGINAL attack of the card, not the halved attack through his effect. So if you effect-summon Fusilier and then slap Megamorph on it, and your LP are lower than your opponent's, he is at 5,600 attack. Combo card #3: Limiter Removal. Thank you, Machine-type. Megamorph + this + Limiter = 11,200 ATK points. Imagine the shock on your opponent's face when you set nothing last turn, they hit you with DDWL for 1500, then you drop those 3 cards all in one turn and smack their DDWL to kingdom come and do 9,700 damage to their LP! Compulsory Evacuation Device can reset his effect...basically, anything that takes a monster on the field and puts it back on works. The Painful Choice dump/revive combo also works well. My idea of a great deck with this card is a Suicide Beatdown with this as the star player. The Traps: 3 Skill Drain, 3 Solemn Judgment (this IS Suicide Beatdown, after all...), Ring of Destruction (in case they stop the attack somehow, you can Ring for a draw), Call of the Haunted. ...and since he's Dark, it could be possible to even throw BLS in the deck, depending on the other machines. Conclusion: Don't be suprised if you get SLAPPED by an 11,200 ATKer in the near future. Advanced: 4.9/5 (I see two small problems -- a deck that isn't made sturdy enough to survive until the combo is pulled, or a Burn/Stall that is running more M/T removal negation (solemns, jammers) than you can get rid of. Otherwise, the deck could work exceedingly well. We start off the week with a card whose name is too long for me to type out again. It’s pretty much the first monster with an effect like the one it has, so it’s quite interesting. With 2800 ATK, it’s just about powerful enough for two tributes; the fact that he’s a Machine adds to the fun, since using Limiter on any monster that strong is just, well, hilarious. There are a few questions that come up when talking about this guy’s effect. Basically, you can choose not to tribute for him, in which case he’ll drop to a 1400/1000. There are some nice combos to abuse with that: Metamorphosis, for example, to bring out The Last Warrior From Another Planet (another long name!) very easily. You can also use Book of Moon on him, then wait until your next turn and flip him face-up, putting him back at his full 2800 ATK glory. There’s also a nice little combo with this guy, Shooting Star Bow – Ceal and Machine Duplication. Summon him using his effect, play Ceal, dropping him down to 400 ATK; then use Machine Duplication to summon two more of these guys to the field, both at 2800 ATK. Even if you don’t feel like using his effect, he’s still a powerful Machine and can still easily win you games by just attacking with Limiter. I’d definitely consider him. Welcome to a week of RDS cards! Today’s card is Fusilier Dragon, a monster with many possibilities. Stats: Fusilier Dragon has 2800 ATK and 2000 DEF. The stats are pretty good for a Level 7 monster, but nothing special. It’s a DARK monster, allowing you to use Double Coston to make Fusilier Dragon a one Tribute monster. It’s also a Machine, giving it a few perks. Stats – Good. Effect: Fusilier Dragon’s effect is the only reason it gets any attention. At the price of half its original ATK and DEF, you can Normal Summon or Set Fusilier Dragon without any Tributes. Now to get something straight; if you use this effect to Set Fusilier Dragon, Flip Summoning it will not make it return to its original stats of 2800/2000. The stats will be still be 1400/1000 in this scenario. Anyway, not much else to say about the effect of Fusilier Dragon; it just makes it a second-rate monster (stat wise anyway). Combos: The combos with Fusilier Dragon are seemingly endless. As you may know, I’m not one to point out that a monster can be used with Metamorphosis, but I’ll bend the rules for Fusilier Dragon. Using Metamorphosis on Fusilier Dragon allows you to Special Summon The Last Warrior from Another Planet. What’s so special about this you ask? If you manage to do this in the first turn and have a Light of Intervention as well, your opponent will be unable to summon any monsters. Great isn’t it? Another combo is to use Megamorph on Fusilier Dragon after being summoned through its effect during a time in which your Life Points are lower than that of your opponent. Doing so will make Fusilier Dragon a 5600 ATK monster, due to the fact Megamorph doubles the original ATK of a monster, making Fusilier Dragon’s effect disappear. A third combo is to somehow make Fusilier Dragon’s ATK equal to or lower than 500. Doing so will allow you to use Machine Duplication on Fusilier Dragon, allowing you to Special Summon 2 more fully powered Fusilier Dragons from your Deck. Combo #4: summon Fusilier Dragon through its effect while Skill Drain is active to return Fusilier Dragon’s ATK to 2800. A final combo is to summon Fusilier Dragon through its effect, and flip it face-down by using Book of Moon or Tsukuyomi. Doing so will return Fusilier Dragon’s ATK to 2800 when it's Flip Summoned. Usability: If you have a Deck that can utilize any of the above combos or the few I haven’t mentioned, you should consider using Fusilier Dragon. Fusilier Dragon is a fun monster with plenty of possibilities. Try it out in the right deck and your opponent will be gone in a turn or two. Traditional Format: 3.5/5. Fusilier Dragon by itself is nothing special, but comboed correctly and it’s your new best friend. Advanced Format: 3.5/5. Fusilier Dragon by itself is nothing special, but comboed correctly and it’s your new best friend. Art: 3/5. It looks neat. It's an interesting card though. Who would've thought that a 7 star can be normal summoned straight fro your hand. Well if you combo cards like maybe mage power, axe of despair, and even megamorph onto this card, then it could be reallly unique. then you have complete beats. I wouldn't say it goes in normal decks. Sure it's a dark monster and sure it's a fun card to play but honestly, i'd rather run a normal attacking monster over this card anyday. *ATTENTION* JAELOVE the idiot made another mistake with his Abyss Soldier review, incorrectly surmising that any card could be discarded. Apologies. 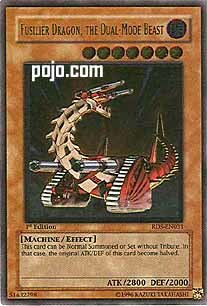 On to Fusilier Dragon, a card that was analyzed in my overview of the Machine deck. It’s an excellent card for the Machine deck because of its combo with Book of Moon (which should be played in a Machine deck period.) Run it and you get a 2800 attack monster, period. Revive it from the graveyard and you get a 2800 attack monster. What’s not to love? The usage of this card can work in two different but viable ways. One is the Fusilier Dragon based deck, where Skill Drain’s activation cost provides a natural incentive to run Megamorph, giving you both a 2800 attack regular monster and a 5600 attack monstrosity with Megamorph equipped. The other route involves standard Machine fare, but this is strictly a support card hoping to leech off the multiple Book of Moons you should be running in the first place. 1400 attack is not bad for the potential to reach 2800. Advantage F/H: Fusilier Dragon is a 1400 attack monster with the potential for 2800. Even having a 20% chance of getting him out on the field (either through dump and revive or the aforementioned combos) for one card gives him a far higher rating than normal. 1400 is just under the “1600 breakpoint” for playable attack scores, but this card definitely shines in the right deck. Best Draw for the Situation: His score improves leaps and bounds over a typical two tribute monster because he can be normal summoned. This effect, mixed with the numerous combos to his name, makes him one of the best two-tribute monsters in the game. Attributes/Effect: Dark monster with very playable stats can transform into a 1400 monster with support. He’s also a machine, making him a great fit in a theme that’s starving for solid candidates. What’s not to love? Dependability: The effect makes him far more playable than other two-tributers. He can always serve as a defensive pinch, and in the right deck you’ll have higher than a 25% chance of using him correctly when you do draw him (Machine decks should run 1-2). The Bottom Line: Great machine. Coin Flip Fusilier Dragon, the Dual Mode Beast. Say that 10 times fast. I'm still curious as to how one pronounces it. I pronounce it Fyuu-shu-leer... but whatever. A very broken card from this set. Here, lemme instruct you in the use. As well as being a 1400 attack topdeck (and thus useless in almost all means), it is a 2800 2-trib. Wow, nice depth, huh? Well, the thing is, a small thing early on like a 1400 attack reduction is unbelievably easily corrected. Let's see... If it leaves its face-up position on the field, its effect disappears. Or, if you apply another modifier like it (like Megamorph), its own disappears. So, what turns this back into a no-trib 2800/2000? Tsukuyomi, Book of Moon, Dimensionhole, Interdimensional Matter Transporter, standard Dumpnrevive, Megamorph (actually, that's 5600/2000 if your LP are lower), Skill Drain, or the various combos involving it and the machine spell that lets you search out up to 2 more of a machine with equal attack. Bokoichi + Dekoichi combo, but effect summon it, equip shooting star bow, and then pull out two more for 6000 total plus field dominance. That, and since it's an easy level 7, Metamorphosis becomes rentsy. 3.5/5 in both formats for overal generic usefulness. GJ to j00.